One year and 43 “events” later Arizona Public Service (APS) says it’s happy with its foray into microgrids and is ready to build more. But not for the usual reason. The utility turned to its two microgrids 43 times not for backup power, but to help restore frequency within the Western Electricity Coordinating Council (WECC), which manages grid reliability for the 14 western states, Alberta and British Columbia, the northern portion of Baja California, Mexico. In doing so, APS demonstrated how microgrids can do more than keep the power flowing to connected buildings during an outage — they can offer worth to the broader electric grid as well. This is important because of an ongoing debate over whether microgrids are gold-plated technology, meant to serve a few customers during outages, or are investments worthwhile to a utility’s broader customer base. “It’s been a great year with the technology. It’s been a great opportunity to partner with our customers, provide individual customer value, but also bring back value more broadly to our larger set of customers,” said Kent Walter, APS manager of customer technology. Walter was among a group from APS that Microgrid Knowledge recently interviewed about lessons learned over the year since the utility began the phased installation of a 63-MW microgrid for Aligned Data Centers and completed a 25-MW microgrid for Marine Corps Air Station (MCAS) Yuma. Grid frequency can go out of balance when a generator suddenly trips off line. 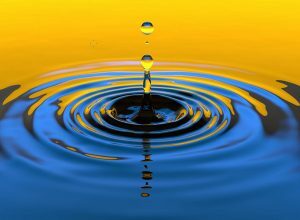 For example, an 850-MW hydroelectricity facility may suddenly stop producing power in the Pacific Northwest, sending a ripple effect through the western states, like a rock dropped in pond. “Picture the rock as the power going off and the waves radiating away as the frequency. The frequency literally shakes down the West Coast,” said Dave Morton, APS energy innovation program consultant. Various generators respond to restore balance. Speed is of the essence. That’s where the APS diesel-based microgrids excelled. Acting together as a single virtual power plant, the two microgrids responded far more quickly than conventional turbines. “Our machines are able to see the deviation, startup and energize into the grid, as well as support the critical load, in under 20 seconds, which is an amazing feat,” Morton said. In contrast, a conventional turbine may take up to an hour to respond if it is not already running, or 10 minutes if it is spinning and ready to go when needed. “WECC gauges our response — how fast we react — and measures it. It is a quantifiable metric we are held to,” he said. The response comes thanks to an APS-designed microgrid controller — what is known as the brain of a microgrid — which monitors the grid at all times and signals for the virtual power plant that the grid needs help with frequency. In addition to speed, the microgrids offer an environmental and economic advantage, according to APS. A turbine that is spinning all the time constantly uses fuel. That fuel costs money and produces emissions. On top of that, the turbine faces wear and tear from constantly running, another expense. “These units are off, monitoring the grid, ready to go, not burning any fuel, not adding wear and tear on equipment and not contributing to emissions until needed,” said John Pinho, APS customer technology project manager. APS is now looking at expanding the two projects, which run on EPA Tier-4 diesel generator sets. They are designed to eventually add solar, as well as energy storage — another fast actor for frequency response, but still more costly than diesel generators. The data center plans to install an additional 25 MW, which is the project’s second phase. This will expand the 12.5 MW microgrid to 37.5 MW. Meanwhile, APS is pursuing additional microgrid projects, some now in the discussion phase; others in design. The utility is focusing on locations where both the customer and grid can be served. “Any time we can create value for the participating customers as well as our non-participating customers, it’s a win,” Walter said. 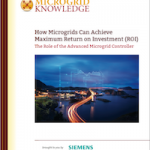 Track the evolving microgrid market by subscribing to the free Microgrid Knowledge newsletter. Great examples. I didn’t even know we had some Micro GRIDS in and working in Arizona. Thanks for a great article to tell the many uses of a Micro GRID.